We Know Pre-Owned Office Furniture. 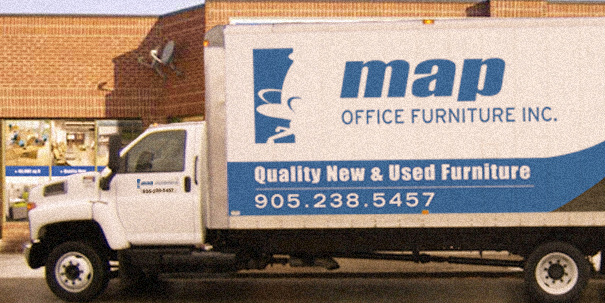 At MAP Office Furniture, we provide an experience unlike any other used furniture resellers by offering high quality pre-owned office furniture that provide the ultimate combination of form and function. You can rely on us for delivery, setup, and everything in between to get your business up and running. We’ll configure and customize your furniture to your unique specifications. We offer complete design services to bring your vision of a better workspace to life. We’re installation experts. Let our pros handle this business, so you can focus our yours! If your company is liquidating, downsizing, or reorganizing, we can help you clean shop. We’ll store your furniture before your move and deliver it when you're ready. We’ve been serving the Toronto Film Industry since 2007 and provide quality rentals for any shoot or set. We’re here to help you build a better workspace.